I thought I would post an update on my soy strawberry candle. It is one fantastic candle! The candle burns perfectly across, no soot and has a wonderful realistic scent. The fragrance fills our whole kitchen and slowly enters into our family room. 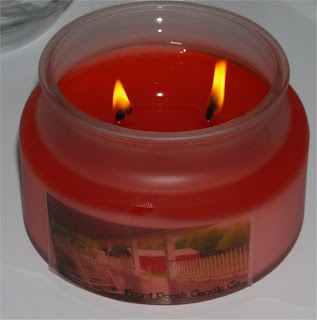 Run over to Front Porch Candle Co. and give them a try. Really, you will not be disappointed in their soy candles! *If you are interested this is my first review of this Front Porch Candle Co. and their soy tarts.